I would like to take this opportunity, on the eve of Janet’s last working day at the Carleton Place Public Library, to say that I believe Janet always rose to the occasion, and enjoyed the hurly burly of it all – and her ability to make it all come together was always a source of pride. She thrived on adversity as much as on the multitude of successes enjoyed by the library over the years. From the smallest, inconsequential detail, like making schedule changes due to winter storms or staff illness, to orchestrating the mammoth rebuilding of the library after the fire of 1986, Janet was there, doing her job and working, along with all of her staff, to make a strong and vibrant library for the Carleton Place community. Janet would see the wider picture and put it all into perspective. This, along with her compassion for others, was and is, her greatest asset. We will miss Janet, but she has certainly earned a happy, healthy, and carefree retirement! Best wishes for the future, Janet. The testing of Canada’s defences at the time we were preparing to base our future on Confederation, and some of the men who shared in meeting that test, have been the subjects of the earlier parts of this story of the threats to Confederation known as the Fenian Raids. The attacks on Canada made across its now undefended southern border in the memorable Confederation years, together with earlier risks of a recurrence of war with the United States, were among the impelling reasons for forming the federal union which is to be honoured in local and national centennial celebrations next year as the birth of our present nation. The traditions of military service of the men of the Ottawa Valley had their beginnings in the stocks which first settled in the Valley. Among them were many who both in Europe and North America had worn the King’s uniform in war, as had their ancestors. The quartermaster general’s department of the forces of British North America had carried out the task of placing on their lands the large number of families of Scottish and Irish emigrants and demobilized soldiers brought here in the area’s formative years of 1816 to 1822. Known first as the Rideau Military Settlements, this area became the judicial district of Bathurst, containing the greater part of Lanark and Carleton counties and of the later settled present county of Renfrew, with Perth as the judicial and district administrative seat of the district, which included the site of the future capital of Canada. As confidently expected when the settlement of this area was planned after the War of 1812, its men were ready to serve their sovereign and their new homeland’s needs in the next calls to arms. These came in attacks on Canada’s borders after the Canadian Rebellion and again after the United States Civil War, and finally in the great challenges of the past fifty years. The Fenian Raids of 1866 had caused a further strengthening of the Canadian militia and a continued vigilance. Among Eastern Ontario military units which were constituted then were the 41st and 42nd Battalions. Both were groupings of militia companies which had been formed to help face the American pressures of the previous five years. The six rifle companies designated as those of the areas of Brockville, Carleton Place, Gananoque, Merrickville, Pakenham and Perth became the 41st Battalion, Brockville Rifles, under Lieut. Colonel James D. Crawford. The 42nd Battalion of Infantry, formed in October, 1866, under Lieut. Colonel Jacob D. Buell, was composed of the six infantry companies based on Almonte, Brockville, Fitzroy, Landsdowne, Perth and Smiths Falls. These two officers contended for parliamentary seats in the first federal elections. At Confederation, Colonel Crawford was elected to Parliament for the Brockville riding, a riding which in the next two elections was won by Colonel Buell. In local promotions of November and December, 1866, Captain Poole of Carleton Place and Captain Gemmill of Almonte became majors of their battalions. Lieutenant John Brown, Carleton Place merchant, became captain of this town’s No. 5 Company. Peter McDougall, textile manufacturer, was commissioned Captain of the Almonte company, with James Rosamond, junior, as lieutenant. Continued company training, with quarterly inspections and annual summer battalion exercises, were carried on for general defence purposes and in anticipation of any further Fenian move. Carleton Place provided its battalion’s brass band, and in June, 1869, it was reported that “through the exertions of Lt. Colonel Crawford, M.P., 41st Battalion clothing and accoutrements have been obtained from the Government for the Band of the Battalion, whose headquarters are in Carleton Place.” A remaining photograph of the band in uniform performing in front of a row of army tents, appears to have been made either during the yearly training period at Brockville in September 1869, or when on active service in 1870 at Cornwall. The renewal of a military campaign against Canada was approved in secrecy at what was called the ninth annual convention of the Fenian Brotherhood, held in December, 1869, in the city of New York. Every American state at that time was said to have been represented by delegates. Arms and ammunition estimated as sufficient to equip fifteen thousand men were smuggled in the following spring to storage depots between Ogdensburg and St. Albans. Malone and St. Albans were selected as main Fenian northern mustering bases. Canadian detection of these preparations led to the posting of five thousand men for a short time in April on Quebec’s borders facing New York and Vermont, where crossings into Canada could be made without water transportation. Additional units were placed at Windsor and Sarnia. In May over a thousand Fenians under their military leader and brotherhood president John O”Neill gathered as a vanguard at Franklin, Vermont. When a border crossing from this point was repelled at Eccles Hill in the last week of May, with Fenian casualties, their leader O’Neill was placed under arrest, on re-entering his home country in his hasty retreat. A smaller Fenian contingent from Malone occupied an entrenched Trout River position inside the Huntingdon border from which it was expelled with even greater ease and a few casualties among the invaders. The Fenian plans proved to be unsuccessful at every turn. They were confined by much nearer to adequate United States government political and military intervention, and were blocked by thorough Canadian defence measures. After the failure of their efforts a number of Fenian leaders were arrested by United States authorities. “General” John O’Neill was sentenced to six months imprisonment. His third and final filibuster was an 1871 attempt to lead an expedition into Manitoba in support of the program of Louis Riel. Canadian militia forces were rushed to main Ontario river border points when the Fenians began their moves in May of 1870 into Quebec’s Eastern Townships. Principal Ontario places of attack were expected to be on the St. Lawrence River front at Cornwall and Prescott. Orders for Ontario Militia units to occupy defence posts from Cornwall to Sarnia were sent by telegraph on May 24th. In Eastern Ontario, men throughout the Ottawa and St. Lawrence valleys, already alerted, left Victoria Day celebrations under active service orders. What was on Mr. W. M. Dunham’s nightstand in 1897? 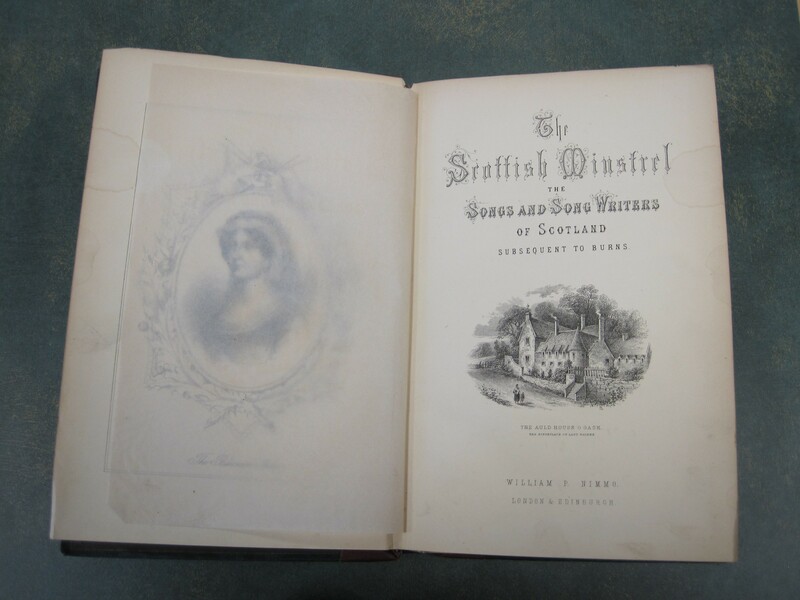 Well, he was reading “The Scottish Minstrel : the songs of Scotland subsequent to Burns , with memoirs of the poets.” This edition by Charles Rogers, was published in 1882, and was #28 in the library collection, making it one of the first books acquired. This subject would have appealed to the many people living in Carleton Place, who were of Scottish and English descent. 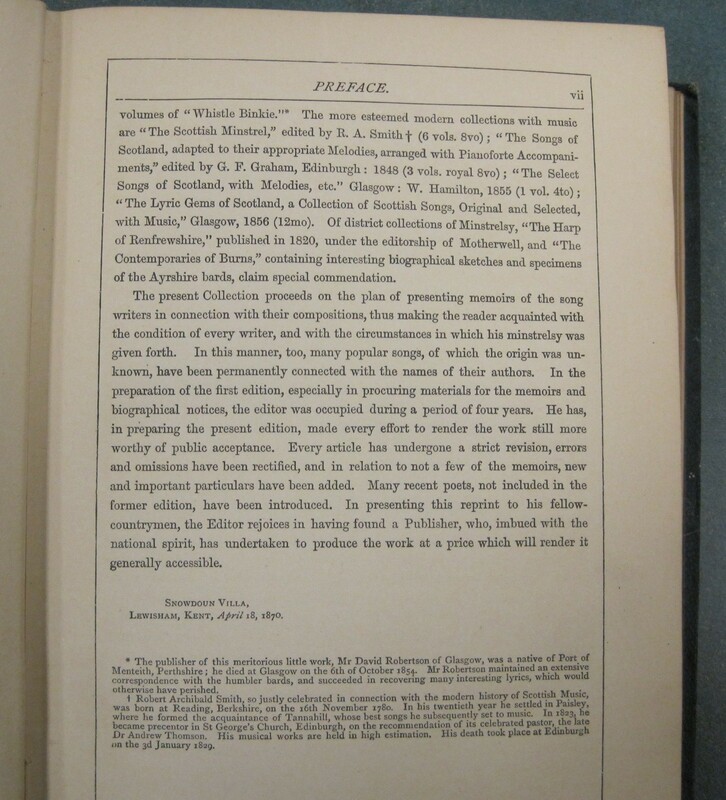 The biographies of the many ‘modern’ bards showcased within are just as interesting to read about now, as they were in the late 1800’s. The frontispiece in this book displays a lovely picture of the Baroness Nairne, who was Carolina Nairne, nee Oliphant (16 August 1766-26 October 1845.) She was a famous Scottish songwriter and song collector, bringing out a collection of national airs set to appropriate words, as well as a large number of original songs. 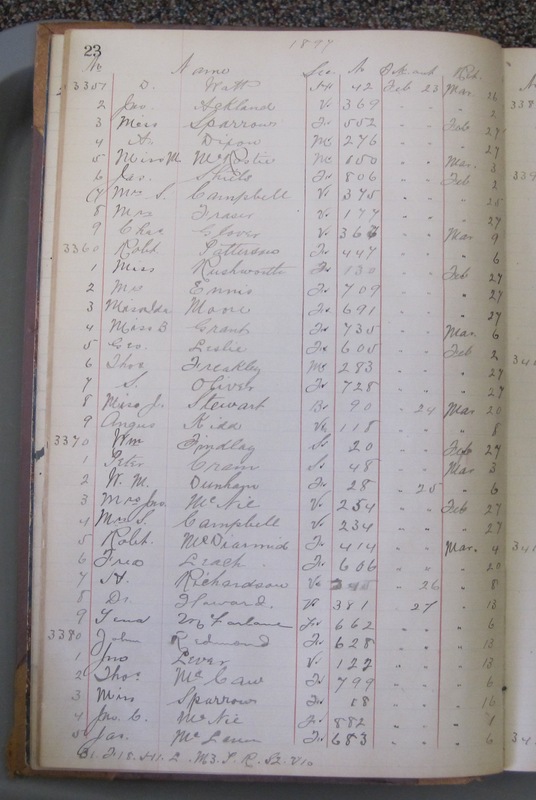 Our ledger shows that it was read in February, 1897 by a W. M. Dunham. After consulting various census and marriage records, we find that William Matthew Dunham was born in Brockville, Ontario in 1849, the son of a doctor, of English descent. He starts out by working as a shop clerk near Brockville, and before his marriage in 1881, he is a clerk working in Ottawa. By 1891 he is living with his wife, Margaret Ann Rochester, and their family of three, in Carleton Place. He was listed as a retail merchant of independent means, dealing in dry goods. More than likely he dealt with some of the abundant woollen mills in Carleton Place. After the 1901 census, he seems to disappear. He and his family may have entertained themselves that winter by singing some of the folk songs found in “The Scottish Minstrel”, like ‘Robin Goodheart’s Carol’, by James Manson. Mysteriously, sometimes the songs indicate which ‘air’ or tune to sing them to, but just as often, they do not. Possibly, everyone was familiar with a great many of the songs included in the book, and just knew enough to sing them to the air “My only Foe and Dearie O!”, or to “Bonny Dundee”. Or maybe they were just as happy to read them like poetry. There’s no way to know. James Manson’s biography says that his songs were ‘sung by admiring circles in Glasgow and throughout the west of Scotland.’ Maybe in Canada too! 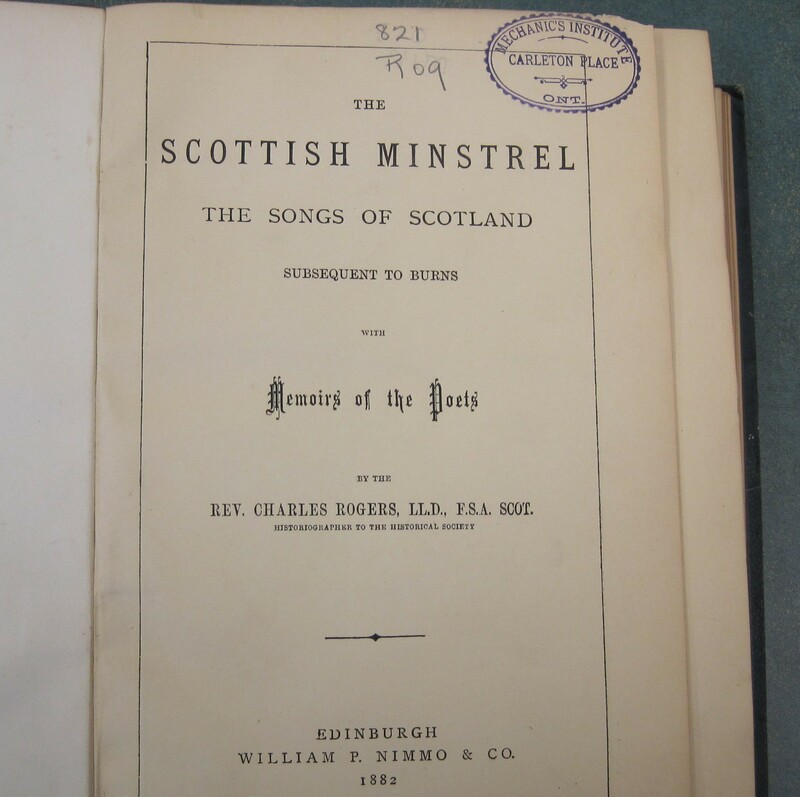 Anyone interested can study “The Scottish Minstrel” at archive.org. Tags: Carleton Place, Carleton Place Local History, Tales From an Open Book, What Were They Reading?